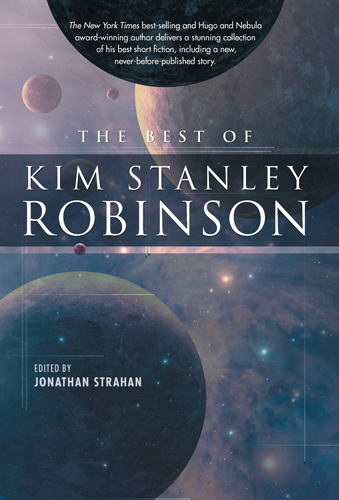 The Best Of Kim Stanley Robinson is a collection of short stories written by Robinson that was published, in hardcover, in July 2010. The publisher is Night Shade Books. It contains 23 stories, including award-winning "The Blind Geometer" and "Black Air", and the previously unpublished story "The Timpanist of the Berlin Philharmonic, 1942". It is published by Night Shade Books. Robinson had previously announced his desire to have some of his short stories republished, as the original editions and previous collections are now difficult to find. As a result, this collection includes stories from the entirety of Robinson's career, from the earliest (The Planet On The Table) to the most recent (The Martians and uncollected). This collection is edited by Jonathan Strahan, editor and reviewer who frequently works on science fiction. During the editing stage, it was estimated to total 160,000 words and 300 pages, which is about as long as The Martians. Adventurers, scientists, artists, workers, and visionaries--these are the men and women you will encounter in the short fiction of Kim Stanley Robinson. In settings ranging from the sunken ruins of Venice to the upper reaches of the Himalayas to the terraformed surface of Mars itself, and through themes of environmental sustainability, social justice, personal responsibility, sports, adventure and fun, Robinson's protagonists explore a world which stands in sharp contrast to many of the traditional locales and mores of science fiction, presenting instead a world in which Utopia rests within our grasp. From Kim Stanley Robinson, award-winning author of the Mars Trilogy (Red Mars, Green Mars, Blue Mars), the Three Californias Trilogy (The Wild Shore, The Gold Coast, Pacific Edge), the Science in the Capital series (Forty Signs of Rain, Fifty Degrees Below, Sixty Days and Counting), The Martians, and The Years of Rice and Salt, comes The Best of Kim Stanley Robinson. These twenty-two stories, including the Nebula Award-winning "The Blind Geometer," and World Fantasy Award winner "Black Air" represent The Best of Kim Stanley Robinson. Part of the book available online by Baen Ebooks. The contents were chosen by Strahan and Robinson by September 2009 (Jonathan Strahan's blog - update on the collection, Sep-06-2009). The volume contains stories and novellas ordered chronologically in their time of writing, and an afterword by Robinson. It includes 23 stories: 5 from The Planet On The Table, the novella "The Blind Geometer", one novella from Escape From Kathmandu, 10 from Remaking History, 3 from The Martians, and 3 previously uncollected stories (including one never before published). Robinson also provided short notes on each of the stories, and an afterword as well.